Hotel Khasa Kothi Jaipur, Khasa Kothi Hotel Jaipur, Reservation for Hotel Khasa Kothi, Jaipur, India. 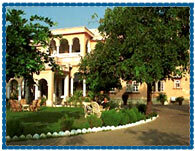 Address: Mirza-ismil Road, Jaipur 302001, Rajasthan, India. Accessibility: 15 kms. from Airport, 0.5 kms. from Railway Station, 0.5 kms. from Bus Stand. The Hotel Khasa Kothi has a heritage building offering an excellent accommodation, value for money, comfort and friendly service for making the stay a memorable experience. Hotel is an ideal destination for a relaxing holiday, fun filled adventure or traveling on Business. Hotel offers 36 Rooms divided into 1Deluxe Non A/C, 27 Suites Non A/C and 8 Cottages equipped with all the modern amenities for comfort. Swimming Pool, Travel Desk, Money Exchange, Beauty Saloon, Laundry, Car Rental, Attach Bath With Hot Cold Water, Direct Dialing Telephone, Television, Banquet Facilities, Barber / Beauty Services, Doctor On Call, Free Newspaper, Health Club, Power Back-Up, Restaurant, Room Service - 24-Hour, Safe Deposit, Fax Service, Photocopy Service, Swimming pool.